Jim Figy was a high school senior with a big decision to make: attend Ohio State and become an agriculture teacher, or continue helping his parents raise ten thousand turkeys on their farm. Jim knew if he deserted his parents, their poultry farm would go under. The choice was clear. He worked there for fifty-two years. 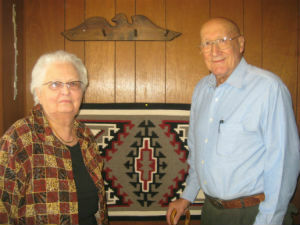 Jim and Hazel May were high school sweethearts, marrying when they were twenty-one. They raised a family, and in their late forties, in response to calls from their church’s national office, began volunteering as a couple. It was the beginning of a life centered on volunteering, often with their children in tow. While growing up, each of them had learned about volunteering by watching their parents help and care for others. Jim and Hazel believe God had a hand in Jim’s decision to work for his parents those many years ago. Over the years, the elder Figys never complained when Jim had to leave unexpectedly for a mission of mercy. If he had been a teacher, he wouldn’t have had the flexibility to go when and where he was called. The Figys feel they have been blessed, especially with their children. Ralph lives in Massachusetts, Rex in Ohio, and Allan resides in Indiana. Daughter Marsha is lives in Maine. The Figys have twelve grandchildren and five great-grandchildren, one whom is deceased. Also among their blessings, the Figy family counts friends from all over the world. In one year alone, they traveled ten thousand miles, spending most nights as guests in private homes and churches. Visitors from all around the globe, including Myanmar, Italy, the Philippines, Singapore, Ecuador, Bolivia, Argentina, Tanzania, England, India, Thailand, Tibet, Sri Lanka, and Côte d’Ivoire, have been welcomed to the Figy home in Wauseon, Ohio. leaders and traveled with the youth to national conventions all over the country. They were dismayed when their teenage son, Allan, got into alcohol and drugs. Around that time, Jim built furniture that was destined for a church in Texas. He invited Allan to help him transport it. When they arrived, the church’s pastor thanked and warmly embraced Allan. The feeling of being totally accepted and valued by a stranger inspired Allan to kick his habits on the spot. The Figy ministry is one of encouragement, reaching out to down and out individuals and churches. • Building a chapel, with their family, at Wounded Knee, South Dakota, on the Pine Ridge Reservation of the Oglala Lakota Sioux. • Taking Anderson University student volunteers to Costa Rica. They endured a scary trip across steep mountains on a banana train. One student became deathly ill. Natives put potato slices on her wrists and ankles. She recovered. • Coordinating five Anderson College student work trips to Mexico and one to Texas. • Over twenty years, making many six hundred-mile trips to eastern Kentucky, to provide assistance to extremely poor residents. • Running into a copperhead snake pit when planting four hundred pine trees on a Kentucky mountain top. • Making home repairs and building wheelchair ramps after Hurricane Andrew hit Florida in 1992. They coordinated volunteers, made repairs, and ministered to parishioners who lost homes when Hurricane Rita hit Texas in 2005. • Helping remodel an old church and build a new one at a Navajo reservation in New Mexico. Now eighty-six, Jim and Hazel regret they cannot accept as many challenges as they used to. However, they still help where they are able: gathering and transporting donations to the Cherry Street Mission in Toledo; non-physical labor with the Voice of the Martyrs in Oklahoma; and gathering and distributing food with the Wauseon branch of FISH (Friends in Service to Humanity). Wounded Knee, South Dakota, is the place that remains closest to their hearts. It is one of the poorest places in the U.S., where unemployment can reach 90 percent. The life expectancy for a Native American woman there is fifty-one; for men, forty-seven. Their son, Rex, is a physician in Toledo. While on rounds during his residency, he encountered a Native American who’d had a seizure while traveling by bus to his home in Wounded Knee. The staff was unable to get his medical history because he refused to speak. Rex stepped forward and told the patient about how, as a child, he had helped build a chapel on the reservation. The man relaxed, gave the much needed information, and followed Rex everywhere until he was released. The couple still helps at Wounded Knee by gathering and transporting donations, painting and repairing buildings, cooking, and leading Vacation Bible School. Want to help build a much-needed Youth and Community Center at Wounded Knee on the Pine Ridge Indian Reservation? For more information, contact Place of Promise, 760 Farmersville Pike, Germantown, Ohio, 45327. Telephone: 937-855-6907; visit online at: theplaceofpromise.org, or send an email to: theplaceofpromise@gmail.com. This article was originally published in the July 2015 issue of Living Today Magazine, Front Porch Publishing, Defiance, Ohio. Special thanks to Barbara Lloyd Nelson, author. Republished by permission. This entry was posted in All Church of God, Great Lakes and tagged Barbara Lloyd Nelson, community, Front Porch Publishing, Hazel Figy, Jim Figy, Living Today Magazine, missions, Native American Ministries, Ohio, Pine Ridge Reservation, profiles, South Dakota, volunteering, Wauseon, Wounded Knee. Bookmark the permalink.